For people who suffer with its painful effects, home remedies for bursitis offer a welcomed relief. Natural cures and home remedies are the safest way to treat conditions like bursitis and many times people find that prescription drugs are not necessary for treatment. By first empowering one’s self with knowledge about what bursitis is and what causes it, natural cures for bursitis can be safely implemented and one’s quality of life can be greatly improved upon. Bursitis is the inflammation of the bursa, which is a lubricating fluid-filled sac positioned between tendons, skin, muscles and bones. The bursa is responsible for decreasing irritation, friction and rubbing between tissues. 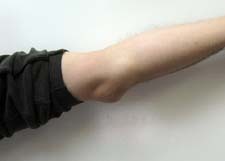 Overuse of a certain limb, such as with playing tennis or gardening can increase the chances of the bursa becoming inflamed. Bursitis most commonly affects people over the age of 40, and symptoms may sometimes come and go. Natural cures for bursitis work best when combined with plenty of rest to give the bursa time to recover. A diet that is high in magnesium, vitamin B12 and calcium should also be consumed during and after a bursitis cure. With Mullein tea, as well as with tea made from comfrey, chaparral and alfalfa, sufferers often find relief by soaking a cloth in the tea and applying it to the inflamed area. Preventative measures can be of help in preventing bursitis in the first place. These measures include strengthening limbs, bone and muscles through exercise, healthy diet, and making sure to properly stretch and warm up before beginning demanding physical activities. In using home remedies for bursitis, a person can experience relief from this painful condition without the use of harmful drugs and without risk of side effects. Natural cures and home remedies are safe, effective and have been trusted for centuries to treat a variety of ailments and their symptoms. Although home remedies for bursitis are safe and effective, anyone who is under a doctor’s care for bursitis or any another condition, is advised to discuss herbal treatment plans with their doctor before beginning, as some herbs may not interact well with certain prescription medications.